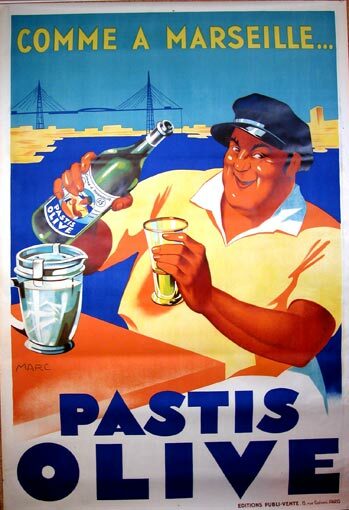 Pastis was first commercialized by Paul Ricard in 1932. While popular throughout France, it is regarded a the drink of Marseille and the south of France. It became popular after the ban on the anise-flavoured absinthe in 1914. The name “pastis” comes from Occitan pastís which means “mash-up”. The popularity of pastis may be attributable to a penchant for anise drinks held by absinthe decades earlier, but is also part of an old tradition of Mediterranean anise spirits such as sambuca in Italy, ouzo, arak, raki, and mastika. Commercial French pastis has a more distinctive liquorice character, Greek ouzo has a more anise flavour. Pastis is normally diluted with water before drinking, typically five volumes of water for one of pastis. Pastis is often served neat with a jug of water for the drinker to blend as he wishes. The reduced alcohol percentage after mixing some of the dissolved constituents insoluble, and the previously transparent pastis go cloudy. The dark yellow colour also becomes paler. The same happens with absinthe and is known as the “ouzo effect”. The drink is drunk cold, often as a refreshment for hot days. Ice cubes can be added (after the water, in order to avoid crystallization of the anethole in the pastis). Cornish Pastis is the first and only pastis made in the UK, at the South Western Distillery in Cornwall . The marketing of Cornish Pastis is wonderfully tongue-in-cheek, playing on the name of “Cornish pasties”. 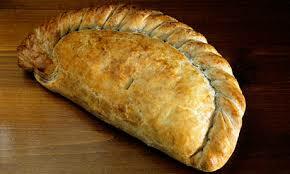 A Cornish pasty is a pastry pie filled with a mix of beef, potato, swede and onion. The Cornish pasty is the food most associated with Cornwall; it is regarded as the Cornish national dish, and accounts for 6% of the Cornish food economy. Baked in the oven, it was taken as a meal for labourers. Nowadays it is widely available, often hot, in high-street shops and at stations. The distillery say that Cornish Pastis is made with local spring water, green aniseed and sweet fennel seeds from Turkey, star anise from China, liquorice root from Uzbekistan, coriander seeds from Bulgaria, juniper berries from Kosovo, angelica root from Poland, orris root from Morocco, green Cardamom from Guatemala, cinnamon from Madagascar, gorse flowers from the Cornish cliff tops, fresh orange, lemon and grapefruit zest. At the Boutique Bar Show, 16th September 2014, Southwestern Distillery had a stand where they were showing Cornish Pastis. I was very impressed by the taste: minty, peppery, with gentle hints of liquorice. Greener, fresher, and mintier than commercial French pastis. Quite delicate and very attractive. When I mentioned the minty taste, the lady at the stand said this was feature of this batch. 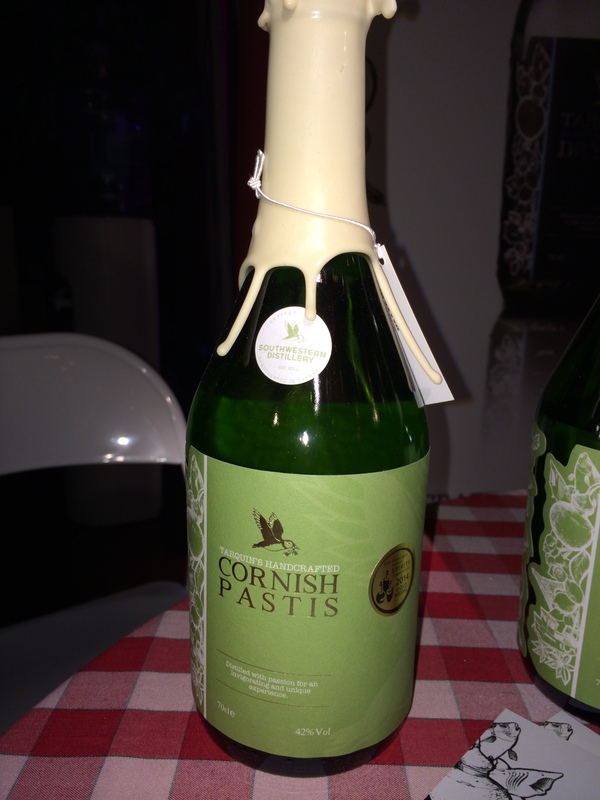 Cornish Pastis is made in batches, which results in some batch variation; less than 300 bottles are made in a batch.